(Bloomberg) -- The long table in Château Lafite Rothschild’s dining room last Friday was set with old silver, smooth white linen and polished crystal, all lit by the soft light of a grand chandelier. On a sideboard sat a selection of superlative vintages dating back to 1905, the year of the first Russian revolution. On the cream-colored walls, portraits of Rothschild ancestors in gilt frames looked on as 14 wine collectors and a solitary journalist slid into their seats alongside Saskia de Rothschild, the new chairman of the company, and her father, Baron Eric de Rothschild, to enjoy a family dinner. The idea? To let guests soak up the Bordeaux first growth’s atmosphere and encourage them on March 30 to bid big—very big—at Zachys’ auction of wines direct from the château’s cellars at Le Bernardin Privé in New York. 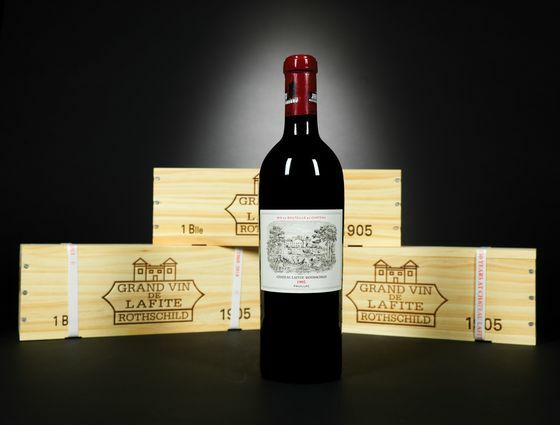 Lafite dug deep into its wine library for the 150th-anniversary auction, which includes vintages from every decade since 1868, the year their ancestor, Baron James de Rothschild, whose marble bust sits in a dining room wall niche, purchased the château for the then-astronomical sum of nearly 5 million francs. I first fell in love with Lafite’s rich, stunningly fragrant 1953, which I purchased at a Chicago tag sale long ago for $2(!) a half-bottle. Then came the deep, tobacco-scented 1961 and later, the fabulous 1982, first tasted out of the barrel in the château’s cellar and a half-dozen times since, including at a dinner right before a Hart Davis Hart auction held the same week Lehman Brothers collapsed. (Everyone drank up as if they’d never have another chance.) I’ve always found Lafite the most subtle, elegant, and beguiling first growth, the one that reveals its nuances and finesse only with age. Before sitting down for dinner, we took a cellar tour with the baron leading the way in his trademark wine-colored, velvet Christian Louboutin slippers. 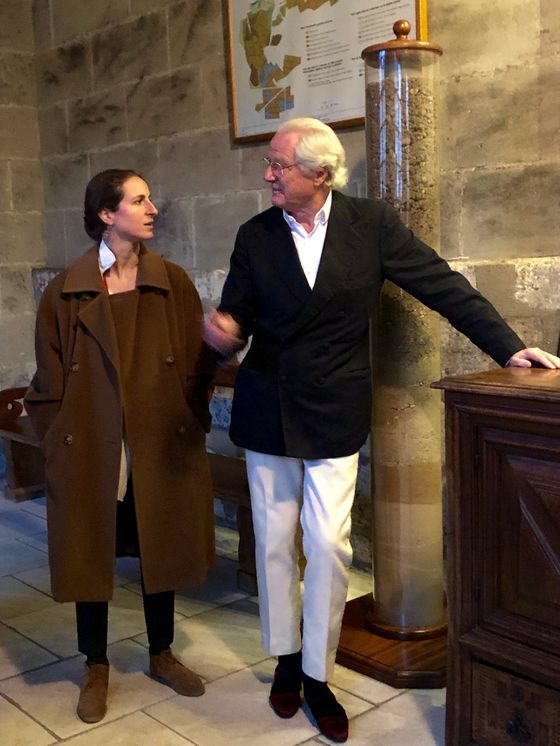 In front of a large, historic map of the estate, he pointed out the 59 Lafite vineyard plots colored in pink, while Saskia described how an eight-person group decides the final blend of Lafite by rating the wine from every plot on a one-to-five scale, with one best. They assess the results for two months, and the wines that score a “1” from most of the tasters are eligible for the grand vin. Last week’s dinner was far more intimate and sedate. In an antiques-laden drawing room with red silk brocade on the walls and tufted chairs, we sipped two aperitifs as portraits of Rothschild ancestors looked on. The was a layered, honey and jasmine-scented 2014 Carmes de Rieussec (the second wine of Lafite’s estate in Sauternes) and a creamy textured 2008 Barons de Rothschild Blanc de Blancs Champagne—the best cuvée I’ve tasted. The intimacy of the evening was reflected in the cuisine familiale menu. We took our seats and soupe VGE arrived—individual tureens filled with delicate broth, winter vegetable, and truffles covered in puff pastry—the first of six courses. To accompany it, Eric picked an intense, truffle-scented 2005 Château L’Evangile from the Rothschilds’ Pomerol estate. Also poured was a smooth, seductive, and rich 1989 Château Duhart-Milon, the neighboring fourth growth that the family purchased in 1962; it was astonishing how well it aged. If anything at the upcoming auction could be considered a bargain, this is it, with an estimate of $1,000 to $1,500 for a case of 12 bottles. Cheese appeared, and with it came the biggest surprise of the evening: the delicate 1905 Lafite (estimate: $3,000 to $4,800 for one bottle). 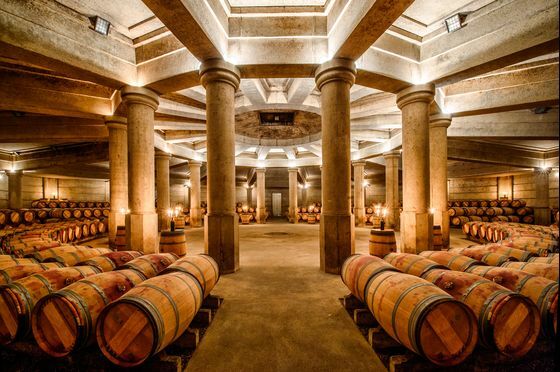 At 114 years, it showed the kind of longevity Lafite is known for, demonstrating why perfect storage conditions are so important when buying old wines. With its silky texture, ethereal scents of plums and currants, and a long finish, it suggested to me a long-ago world. Afterward, we settled into the small, cozy, adjoining salon, where several guests puffed on Cuban cigars and we sipped an old Mirabelle and Lafite’s private label of Tres Vieille Reserve Cognac. I reflected on the pleasure of decades-old wines. “Every wine has its moment, but you have to choose the right moment,” the baron had explained on the cellar tour. Each of the wines poured demonstrated that perfectly. 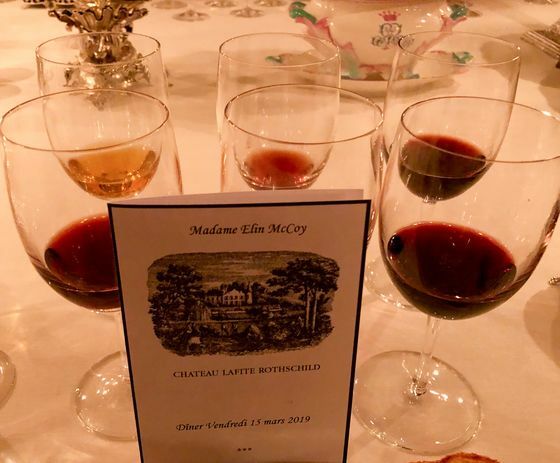 Most of these vintages are available in the upcoming auction, but only the single bottle of 1868 (estimate: $13,000 to $20,000) includes dinner at the château. I’d happily pay that much for dinner alone.